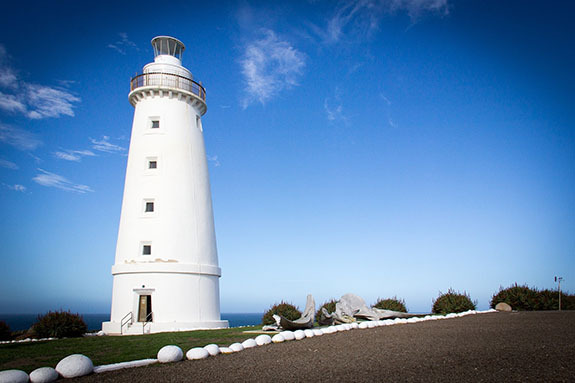 Cape Willoughby Heritage Lighthouse Keepers cottages are a breathtaking location situated at the eastern point of Kangaroo Island. There are three such lighthouse locations on the Island, each having become a popular destination over the last few years. This incredible accommodation features furnished and spacious self contained cottages. Enjoy the isolation and charm of a true lighthouse and discover some of what it would have been like to live in such a beautiful yet remote place. Spectacular sunrises await as the sun crests the water in the east. In the evening you can enjoy the relaxing sound of the waves crashing into the nearby cliffs. It’s also a location where you can take a guided tour of the Cape Willoughby Lighthouse itself and marvel at the 360-degree views of the coastline and the busy Backstairs Passage – a popular, shark infested shipping shortcut for vessels arriving to Adelaide from Melbourne, Sydney and beyond in the days of yore, but nonetheless still used by freighters today. The mainland is easily visible a short distance across the passage. Located just 30 minutes from the ferry terminal that connects Kangaroo Island and the mainland, it’s not a long trip. If you stay for five nights in Kangaroo Island Parks accommodation and receive a Kangaroo Island Tour Pass for free for the duration of your stay – a great way to save. The Cape Willoughby Keepers Heritage Accommodation is just one of 30 unique accommodation experiences available in South Australia’s stunning network of National Parks.